Discounted Food For Pi Day 2019! Guess what day it is?! It’s Pi Day! — BJ’s Restaurant and Brewhouse: Get a mini one-topping pizza for $3.14. — Blaze Pizza:With the app, get $3.14 pizzas all day long. One per customer. 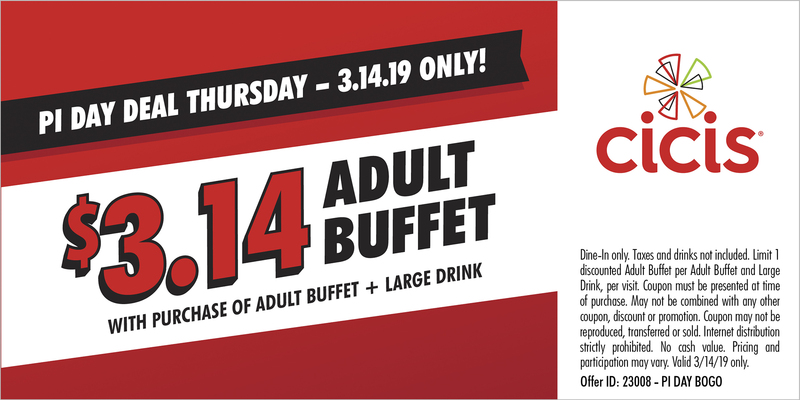 — Cici’s: Get an adult buffet a large drink, get one for $3.14 with a special coupon. — Hungry Howie’s: Get a medium, one-topping pizza for $3.14 with the purchase of any Howie Bread with promo code 19PI. Only good on carryout orders. — Villa Italian Kitchen: Get a full-size Neapolitan cheese pizza for $3.14 with coupon. — Bakers Square: Get $2 off any pie. Double crust and fruit pies will be baked with the pi symbol. — Boston Market: Get a free rotisserie chicken pot pie with the purchase of another pot pie and drink with a coupon. — California Pizza Kitchen: Get a slice of key lime pie for $3.14. — Kroger: Multiple pies are available for $3.14. — Whole Foods: Get a large bakery pie for $3.14 off the regular price.